There is a sign for a motorway service station on the M5 between Bristol and Gloucester that reads “now fully open”. And this fills me with regret. Regret that I have never been to the motorway service station on the M5 between Bristol and Gloucester “now half fully open.” In fitful dreams, yanking back the linen of the dawn, I go to that place “now half fully open”, between junctions 13 and 14, junction 13.5, slipping down the sliproad like a rabbit down a hole. In this place, “now half fully open,” burger chefs are flipping patties of meat not yet cooked, UFOs of bloody mince, hang in the air, unsizzled. The cutlery is not yet stamped out from its blocks of industrial plastic. The carpet not yet laid, the lino untacked and undisguised. The plastic ketchup and brown sauce bottles are translucent, ungutpunched, unfingerprinted, like the hourglass waists of glamour models yet to be squeezed. And there is nothing in the gift shop. Nothing. Except a tea towel of Gloucester cathedral, a cathedral with no roof, just the timber struts of medieval labourers and a wide open sky. There is a story about the band The Happy Mondays snorting ketamine off the exhaust pipe of their tour bus. Now, call me a prude but that’s not my kind of decongestant. I mean those buses run on diesel don’t they? This is my personal festival fantasy; once I’d finished my dirty low down folk set the band would watch me plug my travel kettle into the cigar socket of my electric car and we’d all have a bag of Yorkshire. Yep you heard me right. Yorkshire. That’s a strong brew. I’ve tried them all. Tetleys. Sainsburys Own. That organic one in the nice recycled cardboard with offset print. Man I’ve busted all those cuppas. But Yorkshire really hits the strainer. We are talking a heavy tea bag here. Think Heathcliff in a sodden flannel bodysuit, think Alan Bennett bungee jumping from a really high terraced house, think Michael Parkinson rollerblading against the traffic with quite heavy pebbles in his pockets and you’ve almost got it. And when me and my folk n roll pals hear the roil of that kettle boil we are rushin’ and I mean rushin’ to open the semi skimmed milk and splash it into our medium sized camping mugs. Sometimes I rev the accelerator on my fantasy electric car. Not because that boils the water any quicker but there’s something so thrilling about the barely audible whirr of an electric car that really makes me want to press the tea bag hard against the side of a tin cup. And when you’ve had a cup of Yorkshire tea rocked off the battery of an electric car then man, you are flying. I mean microlite gliding over the Moors in your long johns. A pair of maracas in one hand and toasted tea cake in the other, watching your shoes slip from your feet into freefall. My toe nails are longer than they should be. From a societal perspective. From a personal perspective they’re not too bad. There they are at the end of my body, doing their thing, accumulating sock fluff, incrementally lengthening, building a bridge to the toe cap beyond the River Styx. It’s a myth that the toenails continue growing after death; the skin dehydrates and shrinks away from the nail, giving the ready illusion of growth, but in actuality the nail, like the corpse, is as dead as a pork scratching, as dead as, well, a door nail. And yet there is something about toenails that is definitely “other”. A curious adornment to the body, like an architrave or a skirting board in an otherwise functional room. And, like the Outer Hebrides, or the Northern Shetland islands, they’re far enough away to be foreign without being a foreigner, biding their time on the outer limits of the archipelago of British disinterestedness that is my body. And hell its such a voyage to get down there and spruce them up. I mean we’re talking the whole length of my torso and then some. There’s no finesse in toenail cutting, all gutso and noise and bravura, all crimping and cracking. Far better to let them grow and watch from a distance, like a judge gazes down at the gallery, like a Mafia king surveys his underlings, like an Indian chief sizes up the unknowing tribe in the valley. Their time will come. We all have to be cut short one day. But for now let them eak out their long summers in the dark cave of my shoe. Scratching at the toe cap like the entombed. What the vending machine giveth. Middle Age taketh away. When I was eight the big deal about swimming in the local baths was not about swimming in the local baths it was about the vending machine. The Metal Emperor of chocolate. The Metal Mickey of salt.These push button vending machines were the pin ball machines of the future. Not the push and shove mechanisms of the early seventies and sixties. Oh no. We’re talking plastic keypads and corkscrew plastic. In the vague emotional places of childhood, mostly unreachable, there is one plastic button labelled “A10.” That button that leads to the “Wagonwheel,” the marshmellow and biscuit snack five times rounder and larger than a small boys mouth. “A10” was a time when the mystery of letters and numbers had yet to be explained. When it was supernatural that ABC and 123 added up to the sweet and now. And if I want to conjure up the excitement of a humid lobby, the sting of chlorine, a five pence piece in a five pence hand and the anticipation of chocolate and wafer not yet coal tar on the tongue, I think “A10,” and slowly, inexorably, the memory unwinds from the dark reaches of the unknown past and lands with a satisfying “clunk” in the out-tray of my heart. Now when I go swimming in the local swimming baths I never go to the vending machine. I tried it. They had a different numbering system, no letters, no Wagonwheels. Every single item was available to me. The whole machine could have been mine by extending my credit at the local cashpoint and topping up my rucksac. There was no single button labelled “A10” there was just one large dumpertruck labelled “Everything”. So I carry around “A10” in the inside pocket of my life. At train station platforms, at hospital foyers, at ferry port terminals, the glowing maw of the “other” machines beckon. But I know there will be no button to the past. I know that “A10” is best pressed with eyelids closed, best tasted in dreams unwoken, best thought of when sliding poetry books under unmarked doors. Vending machine technology didn’t change that much. But they went and changed the goddam letters. And now everything can be bought with a language that makes far too much sense. All those comics and sci-fi books were right. Machines did take over the world. And they just keep on selling. Selling. Selling. I’m hanging on to my five pence piece. It’s mine. Mine you hear me. Burning hot silver in my ungrown hand. Somewhere there is a bicycle graveyard. Where the bones of old bikes go. They say the elephant graveyard is the place where the old elephants go to die. They know it. Like they know the nearest watering hole. Like they know the man with the gun is not their friend. They know it deep in the back of their elephant bones. “This is where I go when I die.” They are borne with the knowledge of death in their calcium and cartilage. And they begin their slow trudge away from the herd to die alone. Whenever I see an old bike, beyond repair, embraced by ivy, nustled by holly, chin bopped by bluebells I’m not sad for the old bike. There is nothing more peaceful or pretty than a rusting bike being slowly embraced by the nature that once lifted it up. And like the aging elephants they know they need no compass, no Ordinance survey, no Garmin GPS. No brain on a stick. There is no rider steering them into the final descent. These bikes know when the game is up, when the air will no longer sustain their tyres, perished and unperfected, when the saddle seat post, rusted into the seat tube, will no longer trombone to meet its owner, when the gear cables, long since bled their oil, hang like wicker willow. In the dark of the pre-dawn. Four am. When the straights are in deep sleep and the party heads are too pissed to notice, they creak through the streets, riderless. From their skips and ditches and unchained bike stands. To the bicycle graveyard. Come home to mama. To the deep dark earth. To the quiet stillness of the end of the road. I love the smell of their musty brakepads. Like mushrooms in the shade. Not the hot kind, not the crisp kind, not the burn your tongue with vinegar and ting kind. I like cold chips, the morning after the night before chips, lieing around in the chip wrappings like slobs at the seaside chips. Big fatty bertha chips. Big fatty bert chips. Lathered in the sunscreen of yesterdays fat chips, fruitlessly suntanning in the overcast memories of the kitchen of the night before chips. Sloppy, impotent chips, waning in an eclipse chips, bowed between the sliding grip of thumb and forefinger chips. Guilty chips. Chips that should be binned chips. No way jose for the refuse men chips. Rescued from the horse feed chips. Clagging up the inside chips. On an empty stomach after you’ve brushed your teeth half way out the door chips. Swallowed undisturbed into the safe house of the pot belly dark. Skinny hairless runts come home to the nest that borne them. I like em. Cold chips. Prodigal tatties. Laid to rest. One hand tenderly cradling the stomach of their departure. Digested. Cold chips. Hot at last. 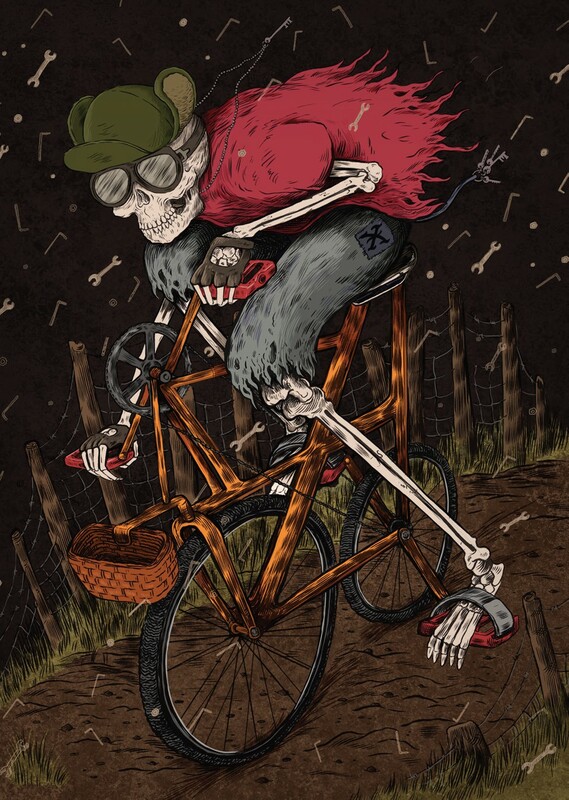 Brand new article in Issue 16 of Boneshaker, “Crank Punk,” with a suitably renegade comic book illustration by Sam Dunn. Issue 16…Has it been that many? I’ve written for every one now except the first. 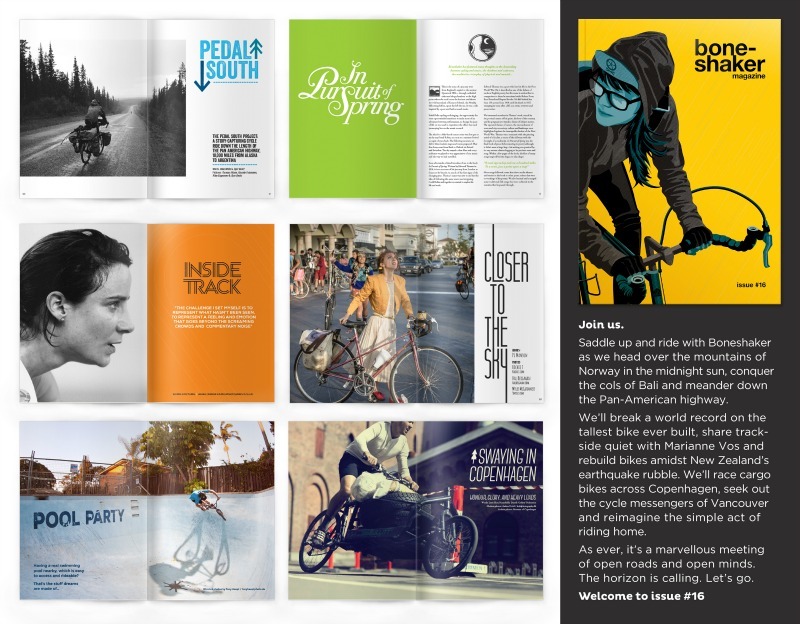 It always astonishes me how natural it is to write about bikes and cycling, as if the bicycle itself is a separate dialect through which anything can be expressed. Whenever I look at my old touring bike now I see not a truck on two wheels but a language of rusting words. Give me a bike and I will give you the world. Or at least an oily phrase book with the corners furled up like an old man’s eyebrows, Denis Healey style, for those who like to cruise Google images for mementos of old school socialism. Those half forgotten moths.